to receive a certificate - valid for 3 years. (International Association of Canine Professionals) as a CEU provider. 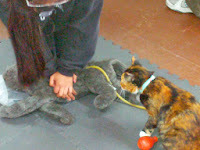 Earn 5 CEU's by completing Walks 'N' Wags Pet First Aid program. is Very Important to Both the Pets and their Human Families. So, consider taking an Upcoming Course. Click here. Join our fun-filled, informative course - the longest standing in Canada. in Dog or Cat emergencies. $149 Please note that certain locations may differ.